The aim of the study was to determine the effect of different malaxation time (30, 60 and 90 min) and temperatures (30, 45 and 60°C) on quality criteria and oxidative stability of Edremit yağlık and Memecik olive oils. For this purpose, olives from Edremit yağlık and Memecik varieties were subjected to crushing, malaxation, pressing and centrifugation operations in laboratory scale and extra virgin olive oils were obtained. Results demonstrated that free fatty acidity, peroxide value and total phenol content of Memecik olive oil were higher than Edremit yağlık variety, whereas K232 and K270 values and induction periods of Edremit yağlık olive oil were higher than Memecik olive oil. The effect of malaxation time and temperature was not influential on free fatty acidity, K232 and K270 values and total phenol content of olive oils. On the other side, a slight increase in peroxide value was determined when malaxation time was increased. The increase in malaxation temperature led to an increase in induction period of olive oils. On the other hand, there was no significant effect of malaxation conditions on the fatty acid compositions of olive oils. Çalışmanın amacı farklı malaksiyon süre (30, 60 ve 90 dk) ve sıcaklıklarının (30, 45 ve 60°C) Edremit yağlık ve Memecik zeytinyağlarının kalite kriterleri ile oksidatif stabiliteleri üzerine etkilerinin belirlenmesidir. Bu amaçla Edremit yağlık ve Memecik çeşitlerine ait zeytinler laboratuvar koşullarında kırma, malaksiyon, presleme ve santrifüjleme işlemlerine tabi tutularak natürel sızma zeytinyağları elde edilmiştir. Çalışmada, Memecik zeytinyağının serbest yağ asitliği, peroksit değeri ve toplam fenol miktarının Edremit yağlık zeytinyağından daha yüksek olduğu, bununla birlikte K232 ve K270 ile indüksiyon periyodunun Edremit yağlık zeytinyağında daha yüksek olduğu tespit edilmiştir. Malaksiyon süresi ve sıcaklığının zeytinyağlarının serbest yağ asitlikleri, K232 ve K270 değerleri ve toplam fenol miktarları üzerine etkisi olmadığı belirlenmiştir. Bununla birlikte malaksiyon süresinin artmasıyla birlikte peroksit değerlerinde hafif bir artış olduğu gözlenmiştir. Malaksiyon sıcaklığının artması ile indüksiyon periyodunun arttığı saptanmıştır. Diğer taraftan, zeytinyağların yağ asidi kompozisyonları üzerine malaksiyon şartlarının önemli bir etkisi olmamıştır. Angerosa, F., Mostallino, R., Basti, C., Vito, R. (2001). Influence of malaxation temperature and time on the quality of virgin olive oils. Food Chemistry, 72(1): 19-28, doi: 10.1016/S0308-8146(00)00194-1. AOCS. 2003. Official methods and recommended practices of the American Oil Chemists’ Society, AOCS Press, Champaign, IL (USA). Boselli, E., Di Lecce, G., Strabbioli, R., Pieralisi, G., Frega, N. G. (2009). Are virgin olive oils obtained below 27° C better than those produced at higher temperatures?. 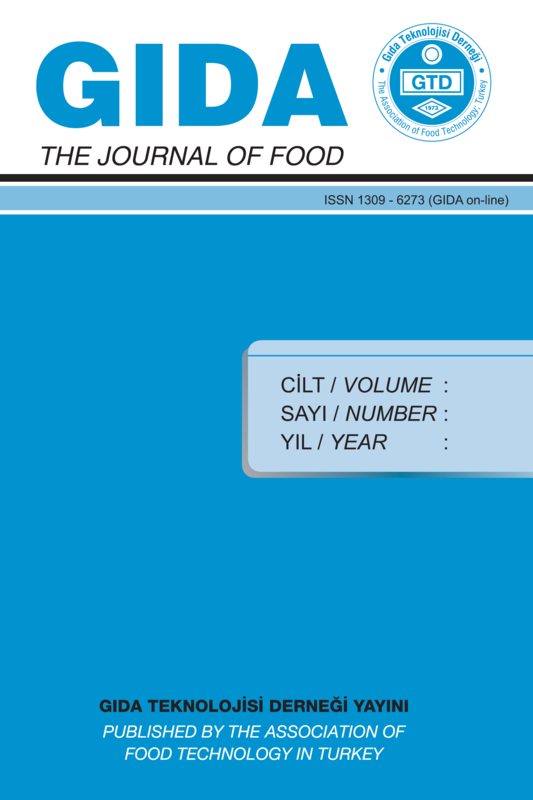 LWT-Food Science and Technology, 42(3): 748-757, doi: 10.1016/j.lwt.2008.09.018. Clodoveo, M. L. (2012). Malaxation: Influence on virgin olive oil quality. Past, present and future–An overview. Trends in Food Science & Technology, 25(1): 13-23, doi: 10.1016/j.tifs.2011.11.004. Di Giovacchino, L. (1991). L'estrazione dell'olio con la centrifugazione diretta delle paste di olive. Nota I, Influenza della gramolazione. Rivista Italiana delle Sostanze Grasse, 68(8): 413-420. Di Giovacchino, L., Sestili, S., Di Vincenzo, D. (2002a). Influence of olive processing on virgin olive oil quality. European Journal of Lipid Science and Technology, 104(9‐10): 587-601, doi: 10.1002/1438-9312(200210)104:9/10<587::AID-EJLT587>3.0.CO;2-M.
Di Giovacchino, L., Costantini, N., Ferrante, M. L., Serraiocco, A. (2002b). Influence of malaxation time of olive paste on oil extraction yields and chemical and organoleptic characteristics of virgin olive oil obtained by a centrifugal decanter at water saving. Grasas y Aceites, 53(2): 179-186, doi: 10.3989/gya.2002.v53.i2.302. Gutfinger, T. (1981). Polyphenols in olive oils. Journal of the American Oil Chemists' Society, 58(11): 966-968, doi: 10.1007/BF02659771. Inarejos-García, A. M., Gómez-Rico, A., Salvador, M. D., Fregapane, G. (2009). Influence of malaxation conditions on virgin olive oil yield, overall quality and composition. European Food Research and Technology, 228(4): 671-677, doi: 10.1007/s00217-008-0977-9. Kalua, C. M., Bedgood, D. R., Bishop, A. G., Prenzler, P. D. (2006). Changes in volatile and phenolic compounds with malaxation time and temperature during virgin olive oil production. Journal of Agricultural and Food Chemistry, 54(20): 7641-7651, doi: 10.1021/jf061122z. Lercker, G., Frega, N., Bocci, F. Mozzon, M. (1999). Volatile constituents and oxidative stability of virgin olive oils: influence of the kneading of olive-paste. Grasas y Aceites, 50(1): 26-29, doi: 10.3989/gya.1999.v50.i1.632. Montedoro, G., Servili, M., Baldioli, M., Miniati, E. (1992). Simple and hydrolyzable phenolic compounds in virgin olive oil. 1. Their extraction, separation, and quantitative and semiquantitative evaluation by HPLC. Journal of Agricultural and Food Chemistry, 40(9): 1571-1576. Morales, M. T., Aparicio, R. (1999). Effect of extraction conditions on sensory quality of virgin olive oil. Journal of the American Oil Chemists' Society, 76(3): 295-300, doi: 10.1007/s11746-999-0234-9. Parenti, A., Spugnoli, P., Cardini, D. (2000). Gramolazione e qualità dell'olio di oliva. Rivista Italiana delle Sostanze Grasse, 77(2): 61-64. Ranalli, A., Contento, S., Schiavone, C., Simone, N. (2001). Malaxing temperature affects volatile and phenol composition as well as other analytical features of virgin olive oil. European Journal of Lipid Science and Technology, 103(4): 228-238, doi: 10.1002/1438-9312(200104)103:4<228::AID-EJLT228>3.0.CO;2-7. Ranalli, A., Pollastri, L., Contento, S., Iannucci, E., Lucera, L. (2003). Effect of olive paste kneading process time on the overall quality of virgin olive oil. European Journal of Lipid Science and Technology, 105(2): 57-67, doi: 10.1002/ejlt.200390018. Salas, J. J., & Sánchez, J. (1999). The decrease of virgin olive oil flavor produced by high malaxation temperature is due to inactivation of hydroperoxide lyase. Journal of Agricultural and Food Chemistry, 47(3): 809-812, doi: 10.1021/jf981261j. Servili, M., Baldioli, M., Montedoro, G. F. (1994). Phenolic composition of virgin olive oil in relationship to some chemical and physical aspects of malaxation. In II International Symposium on Olive Growing 356 (pp. 331-336). Servili, M., Selvaggini, R., Taticchi, A., Esposto, S., Montedoro, G. (2003). Volatile compounds and phenolic composition of virgin olive oil: optimization of temperature and time of exposure of olive pastes to air contact during the mechanical extraction process. Journal of Agricultural and Food Chemistry, 51(27): 7980-7988, doi: 10.1021/jf034804k. Turkmen, N., Sari, F., Velioglu, Y. S. (2006). Effects of extraction solvents on concentration and antioxidant activity of black and black mate tea polyphenols determined by ferrous tartrate and Folin–Ciocalteu methods. Food Chemistry, 99(4): 835-841, doi: 10.1016/j.foodchem.2005.08.034.